Kawasaki KLR 650 Forum > General Forum > Site & Industry Homepage News > Hint at Re-Released KLR model? Hello all, Just some background on this, I emailed Fasst Company (They make handlebars that flex when you land, and anti-vibration footpegs) about making anti-vibe pegs for the KLR. 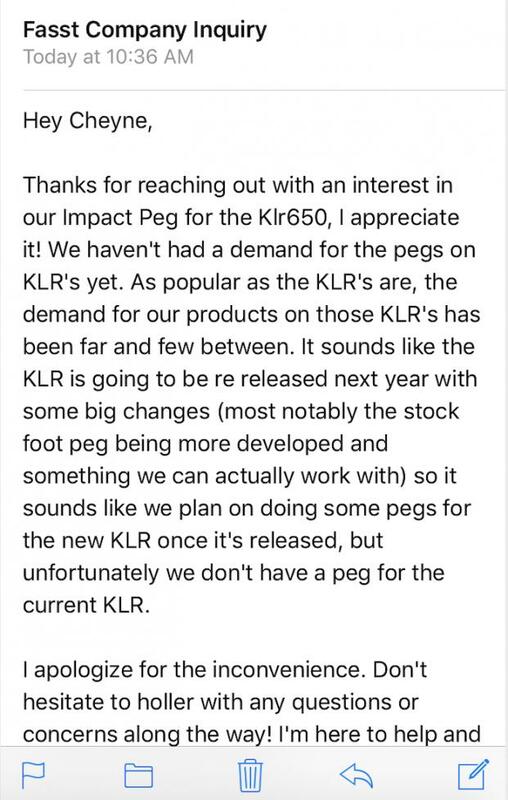 They emailed me back explaining that they haven't had the demand from KLR riders for footpegs that fit the old girl, but hinted that Kawasaki is coming out with a re released KLR next year with "some big changes." I added a screen shot of the email, I'm not saying this is definite news of anything coming out, and I honestly doubt its true, but its the only thing I've see about the KLR coming back from the dead. Please do not lecture me on the effects of temperature and density altitude on an internal combustion engine. Thank you. The size of that footrest clevis has been quite common on many Kawasaki models for over 40 years if I'm not mistaken. I think they may be the same size as the Suzuki DR650, see if they list a set?